Khenpo Chökhyap (Tib. མཁན་པོ་ཆོས་ཁྱབ་, Wyl. mkhan po chos khyab), short for Pema Chöying Khyapdal (Tib. པད་མ་ཆོས་དབྱིངས་ཁྱབ་བརྡལ་, Wyl. 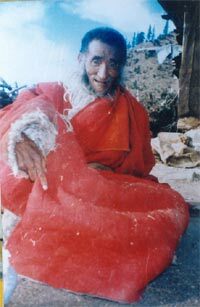 pad ma chos dbyings khyab brdal) (1920-1997) — an important disciple of Yukhok Chatralwa, Pöpa Tulku and Khenpo Thupga. He studied for three years with Yukhok Chatralwa Chöying Rangdrol, receiving the extraordinary Dzogchen pith instructions of the Nyingtik, following which he studied for twelve years with Pöpa Tulku, becoming therefore both a great scholar and highly realized master. He passed away on the third day of the third month of the Fire Ox year (1997). This page was last edited on 24 May 2018, at 23:22.